A huge condo development in South Boston is set to be auctioned tomorrow. The site is an entire block and is bordered by C & D Streets and West 1st & West 2nd Streets. The development was going to be called Emerald Court and the BRA approved plans were for 245 condos, 3600 sq. ft. of retail space and parking. Not surprising in this tough economy, the developer has had a difficult time financing the project. 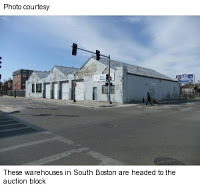 The parcel is located in one of the hottest areas in South Boston. It's walking distance to the Seaport District, and there are 2 new developments just a block away, the Spice lofts, and the Signal Building. It's certainly disappointing to hear plans will not be moving forward, but hopefully a new developer will purchase the site and build in the next 6-18 Months. Last updated April 25 at 3:39 pm.